ms Zaandam’s mid-sized build may not be able to accommodate very many passengers, but because of this she is able to offer more comfort than other ships. Enjoy your holiday in her stylish rooms and wonderful atmosphere. 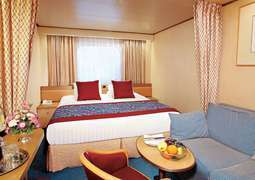 Like on all ships in the Holland America Line fleet, all cabins aboard ms Zaandam are spacious and tastefully designed. 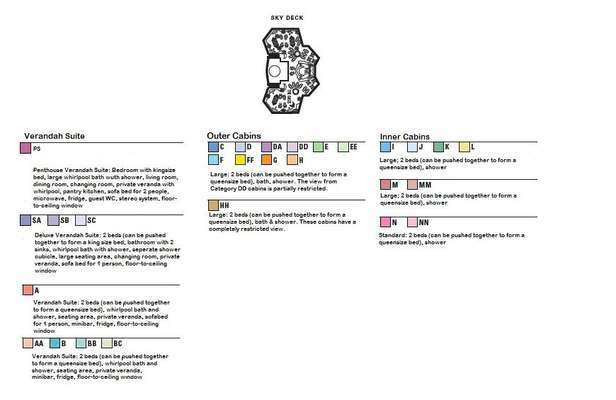 Feel free to choose between four main categories, which are then divided into numerous subcategories. With a selection of cabins ranging from comfy inner cabins to luxurious Penthouse Veranda Suites, everyone is sure to find the right accommodations to best fit their needs. 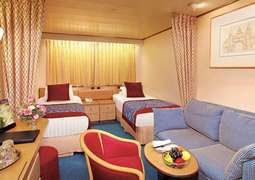 ms Zaandam offers 22 wheelchair accessible cabins. The many different dining options aboard ms Zaandam ensure satisfaction for all. Enjoy a casual breakfast, lunch, and dinner in the Lido Restaurant’s relaxed atmosphere, or dine in the Rotterdam Dining Hall for excellent service, an extensive wine list, and delicious 5-course menus of continental and vegetarian cuisines. A visit to the Culinary Arts Center is a must for all cooking enthusiasts. There you can not only watch master chefs and top-class guest chefs at work, but also take part in interactive cooking courses. If you’d like a special, elegant evening out, reserve a table at the Pinnacle Grill and enjoy specially selected, first-class meals. Coffee lovers will feel right at home in the cosy Explorations Café. There are also many additional bars, such as the Sea View Bar or Piano Bar, where you can relax with a drink and just take it easy. Music is the prevailing theme aboard ms Zaandam in design, entertainment and activities. For example, have a look at the baroque Dutch organ in the Atrium or explore an exhibit about different styles of music worldwide, which includes such items as one of Bill Clinton’s saxophones and signed guitars from Eric Clapton, Queen, and the Rolling Stones. Take a guided tour of the art collections with the help of your iPod. Have you ever taken holiday photos and had them not turn out as well as you had expected? This time around you could participate in a digital workshop to learn how to take better photos and videos, as well as how best to edit them and create photo albums. Stop by the Crow’s Nest for an incredible 270° view of the surrounding landscapes during the day, then come back again at night when it transforms into a classy nightclub. The Mondriaan Show Lounge is the entertainment hotspot aboard ms Zaandam. There you can enjoy excellent performances by singers, dancers, magicians, and comedians, as well as fantastic varieté shows. The Sky Deck is the place to be for relaxing in the sun by the pool. There are also plenty of activities for kids. Children between the ages of 3 and 12 can play with others under supervision in the Club HAL, whereas teens from 13 to 17 can hang out, have fun, and make new friends in The Loft or The Oasis. 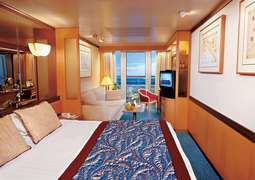 ms Zaandam has numerous sports offerings ranging from aerobics courses to table tennis. If you’re looking to stay active on your holiday, you could work out with a wide selection of exercise equipment in the fitness centre or challenge friends and family to a game of basketball or tennis on the game courts. The Greenhouse Spa & Salon is the place to go to relax with massages or beauty treatments after a tiring workout or land excursion. There you are also welcome to use the Thermal Suite or get a manicure or new hairstyle before a special evening. ms Zaandam is home to a jeweller and multiple duty free shops. Go on a shopping spree in the Shopping Center and find great souvenirs to bring home.